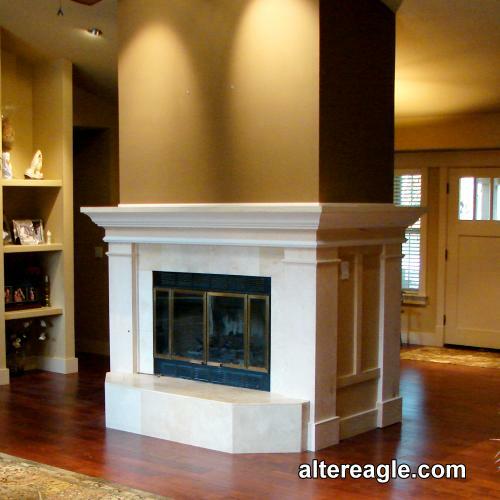 proportion and scaled for your fireplace and installed by a master craftsman. 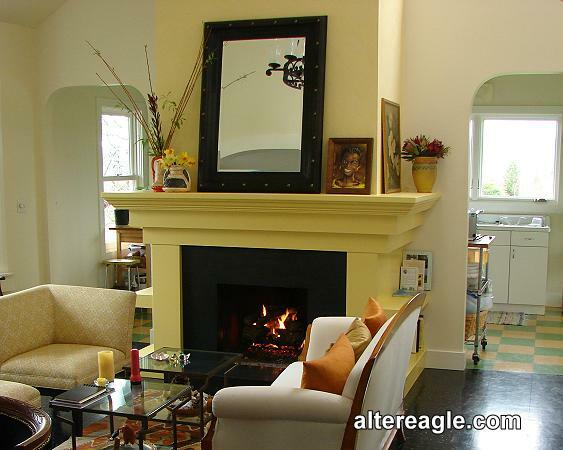 You can find the Golden Ratio in all corners of ancient architecture, literature, artwork and through out nature. 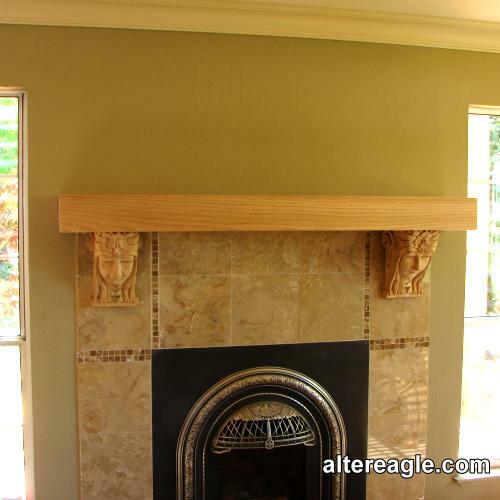 Not all mantels can be designed to use the golden ratio but I personally find it a perfect place to start. 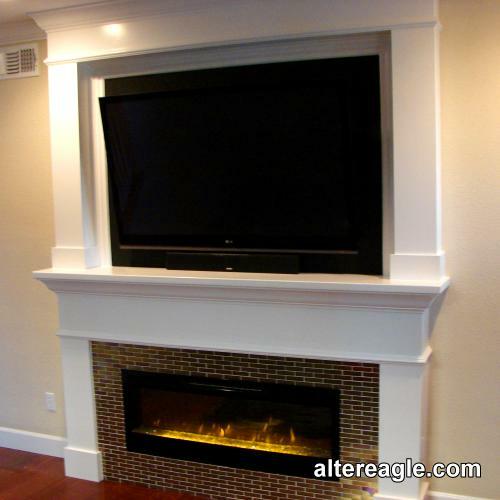 The fireplace insert or existing firebox determines a lot of the design. 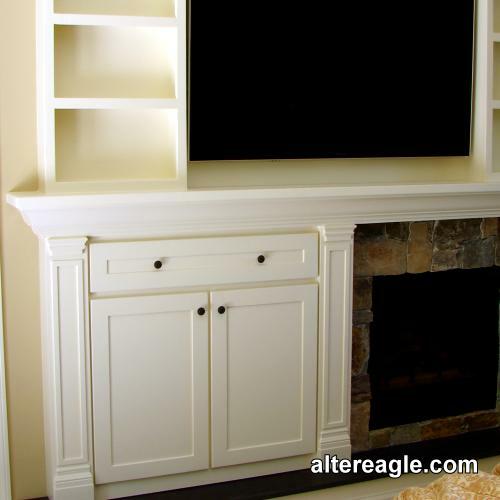 Then the mantel is scaled to how it fits in with the room, the type of mantel being used and if it will include side cabinets or overmantel with a panel or TV. Whether ancient Greeks were unconsciously influenced by the presence of the Golden Ratio in their natural surroundings first and were led to develop toward that proportion, or whether they discovered its beauty first and then chose to model after it we will never know. Euclid (325–265 BC), in his Elements, gave the first recorded definition of the golden ratio and the ten scrolls of Vitruvius' De architectura (15 BC) a Roman architectural study that survived from antiquity mention it's use in greek temple design. In De divina proportione (On the Divine Proportion) Leonardo da Vinci illustrated some drawings which led some scholars to speculate that he used it in his paintings. 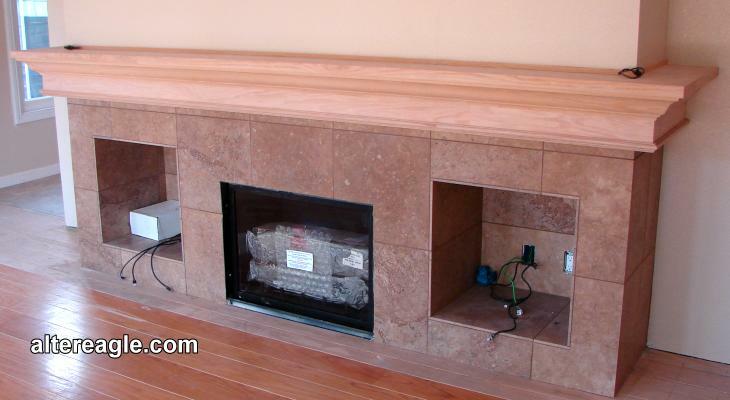 Phi named after Phidias (490–430 BC) an architect and considered the greatest of Greek sculptors. It is generally believed that Phidias directed and supervised the construction of the Parthenon, as well as carved it's frieze and sculptural decorations that seem to embody the golden ratio. Some studies of the Acropolis conclude that the Golden Ratio appears in several constructions and layouts of the Parthenon. 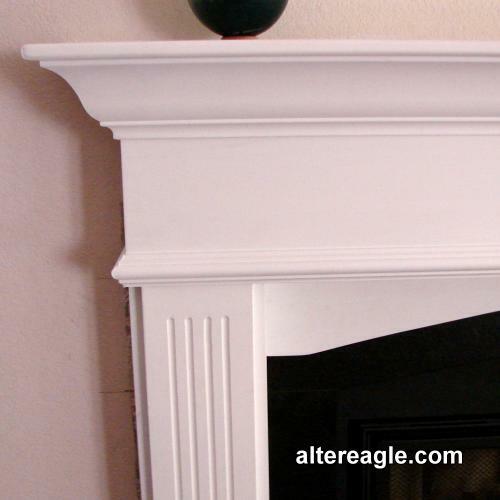 Classical order of a mantel is basically the same as that of an ancient temple. 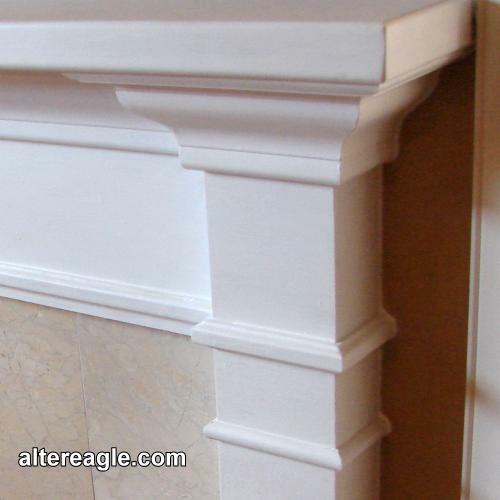 The top section or entablature with the cornice, frieze and architrave being supported by the columns with a base. 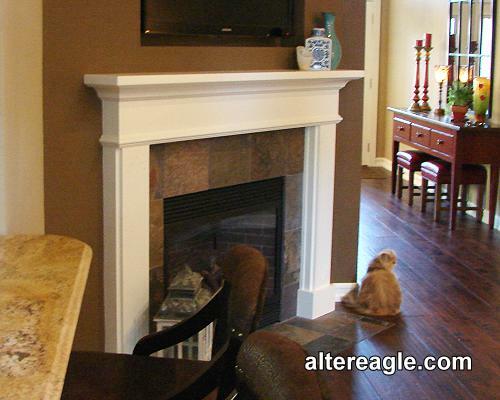 A mantel surround includes the top section (entablature) and two columns (pilasters) framing the entire fireplace. 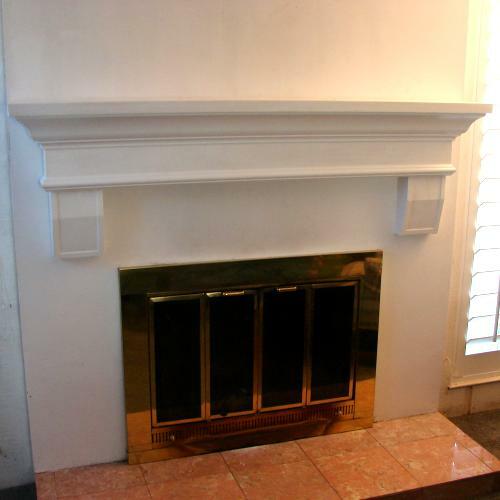 They usually sit on the hearth which is the base of the firebox. 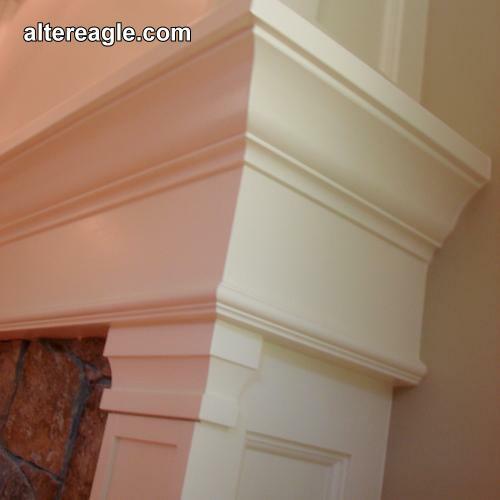 The final color is applied once they installed and can be pre-primed in the shop. 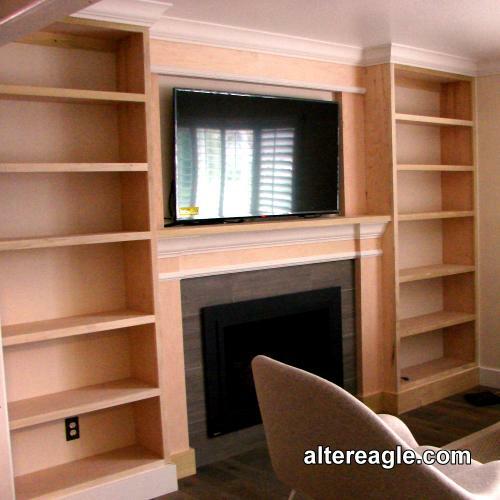 Estimating & Installation: A paint grade custom surround can be estimated during a site visit. 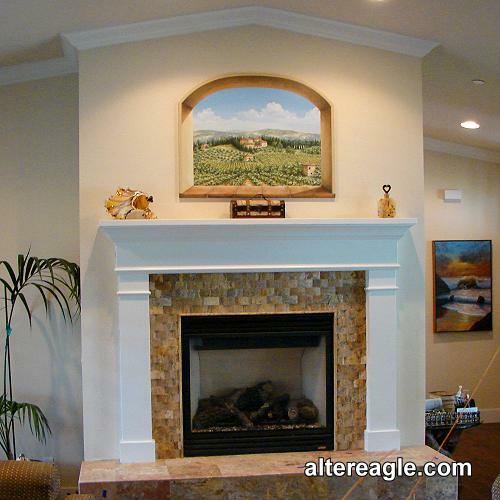 They are typically measured after a tile or face update and installed over the existing brick or new tile. 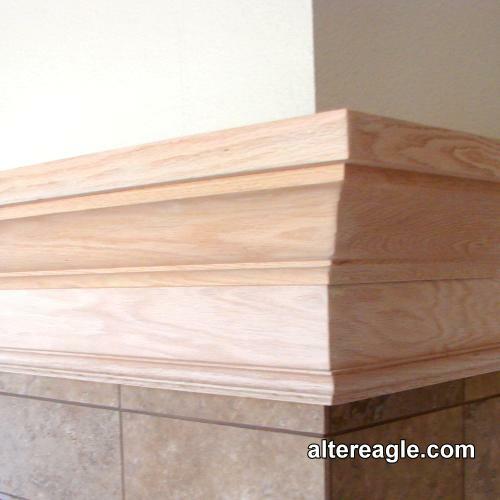 The side clearance is 6 to 8 inches at the pilasters and the top 10 to 12 inches to where the entablature starts. 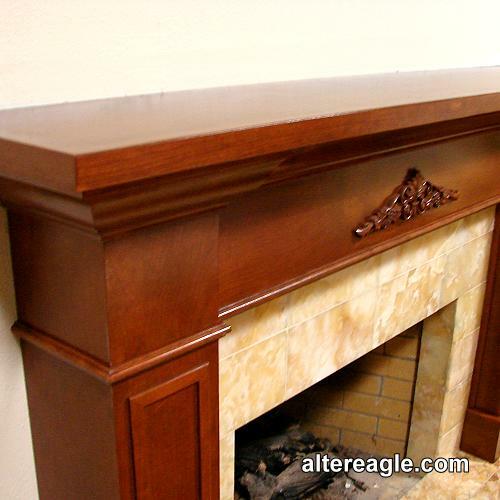 Combustible fireplace mantel materials like wood need to be held back from the firebox opening. 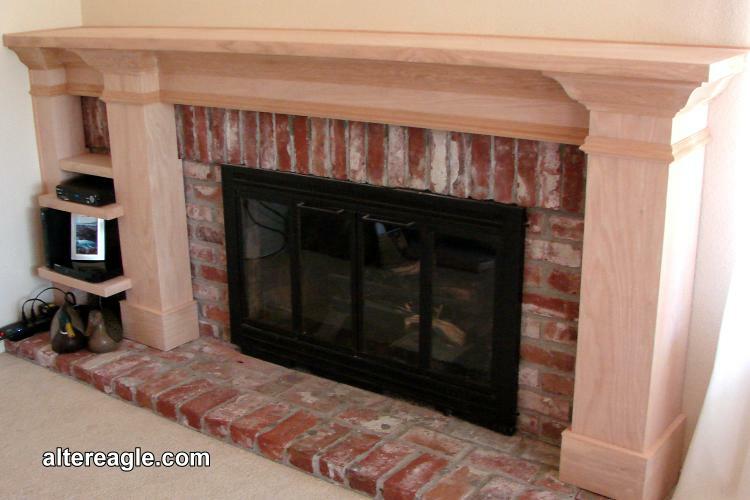 Wood burning masonry fireplaces can throw hot embers even through the screen so the Hearth is a min. 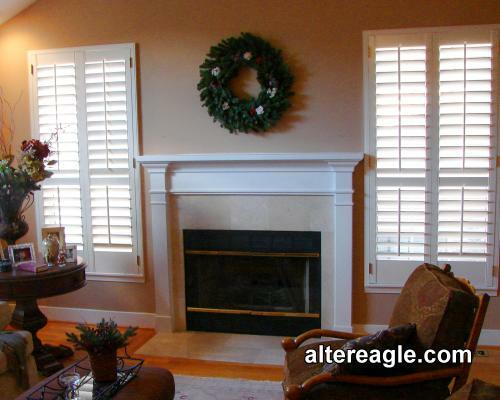 16" out from the face and 8" each side. Code defers sealed gas inserts and wood burning zero clearance contained units to the safe fire clearances in their instruction pamphlet. 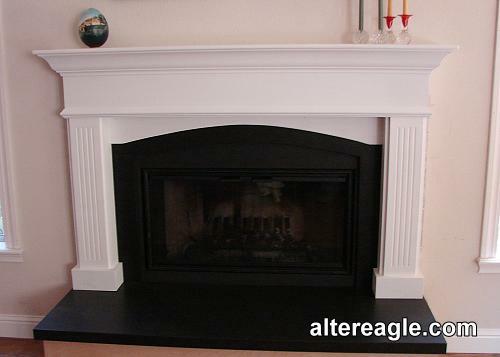 Typically gas zero clearance units don't require a hearth if not above the inserts base. 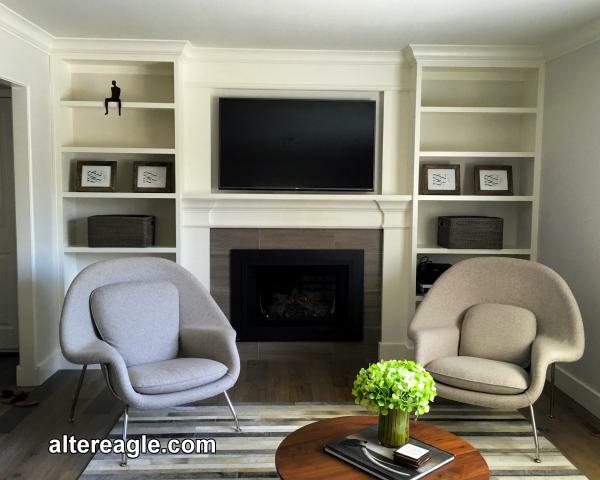 Local codes take precedence over any national code. Here in the North Bay we adhere to the new UBC the IRC and the NFPA (National Fire Protection Association) so we are well protected if we follow the rules. 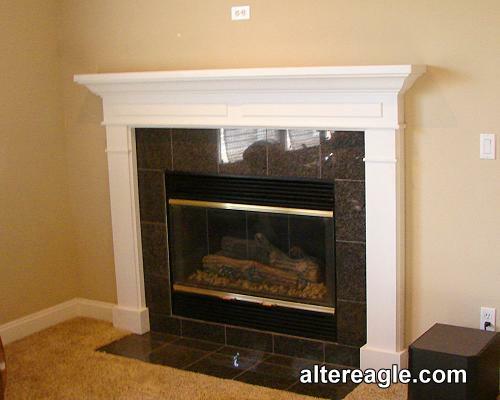 It's a little ambiguous and hard to find but all combustible trim-work needs to be a min. 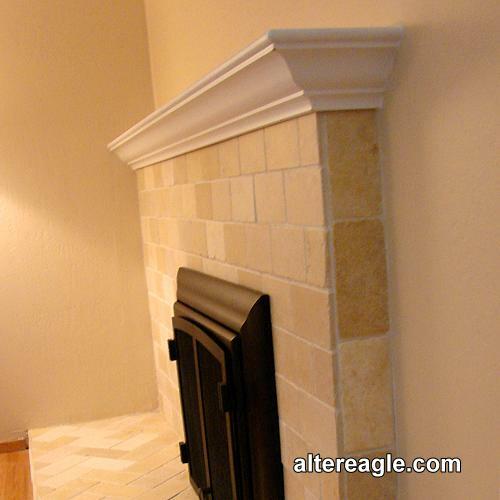 6" from the fireplace opening. 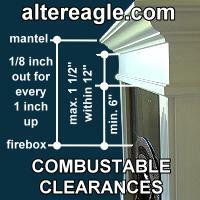 The combustable can't be more than 1 1/2" within 6" inches, then the projection is 1/8" to 1", so every 1/8 out you need to be one inch farther up. 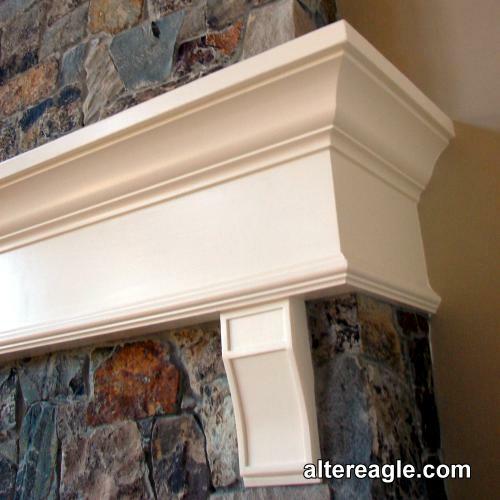 For the mantel tops I personally try to start at 11" above before I start building out. The column min. 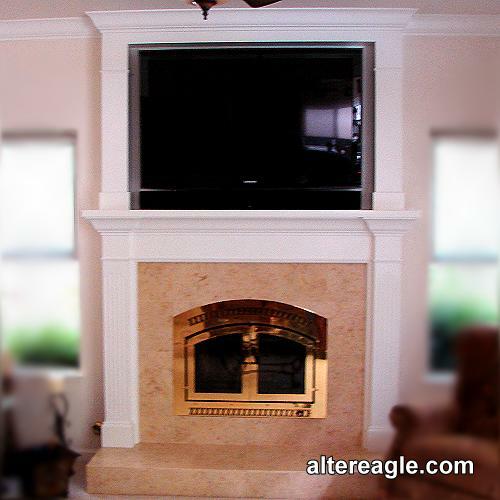 I start at 6" over then start the projection with a max. 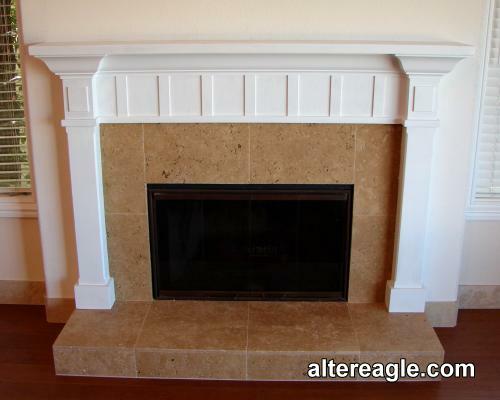 of 1" to 1" or 45 deg. 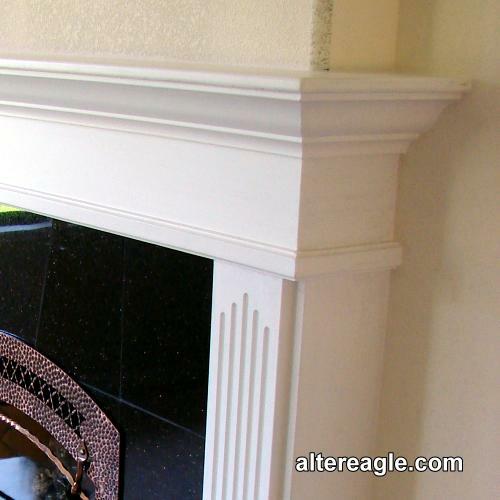 from the opening, so I use one inch over for every inch I go out from the firebox. 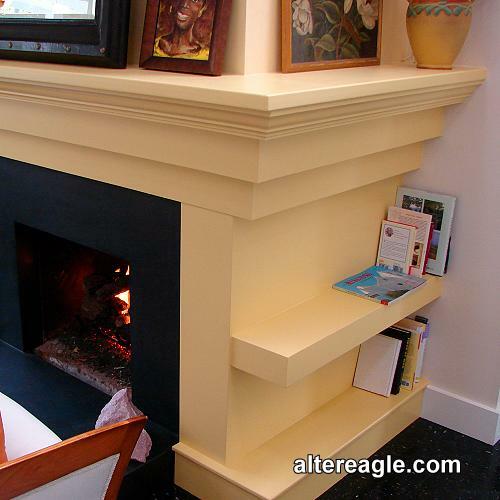 The National Fire Protection Association (NFPA) has similar requirements as the 2009 IRC. 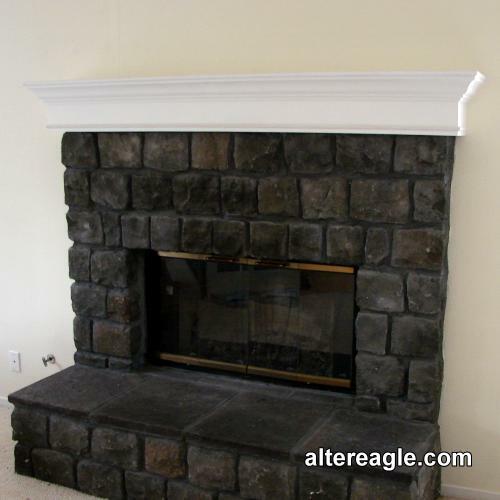 The NFPA code states that any mantel must be at least 6 inches from the fireplace opening. 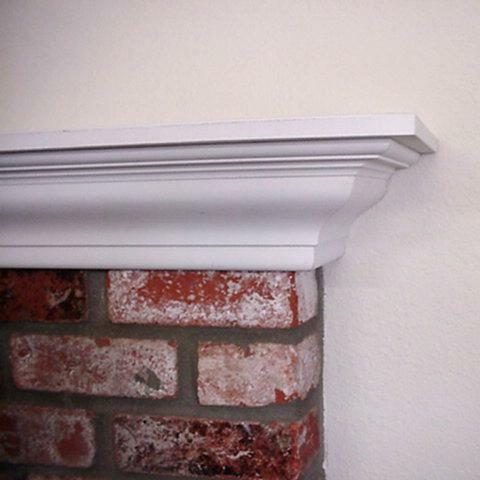 In addition, any combustible trim elements measuring at least 1 1/2 inches thick must be at least 12 inches from the fireplace opening which is equivalent to the IRC ruling which requires 1 inch of distance for every 1/8 inch of projection. 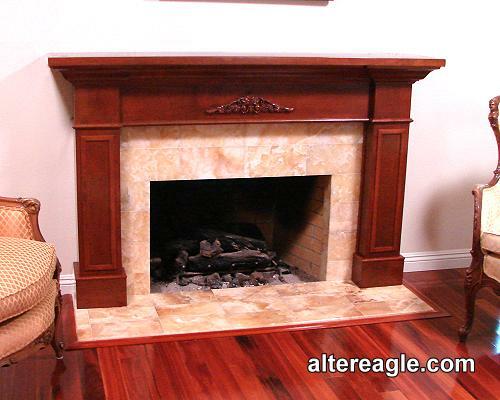 A fireplace surround can have an overmantel typically of similar design. 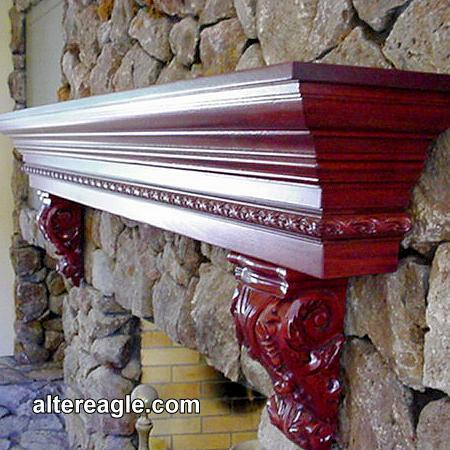 Traditional overmantels in Victorians and Craftsmans used a panel or mirror but are popular once again for framing a television. 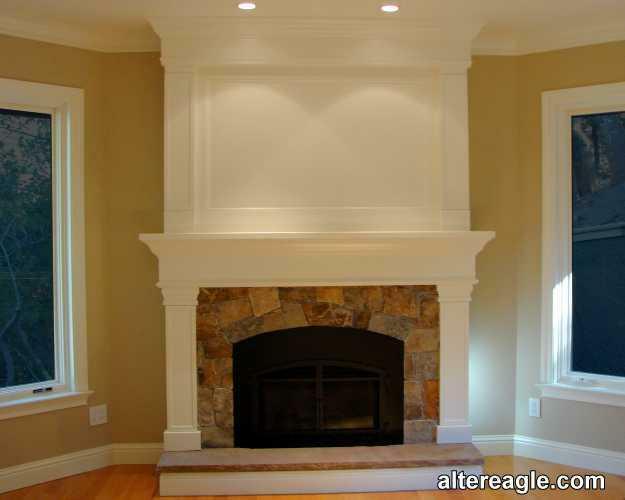 They also strike a good balance with higher ceilings or side cabinets. 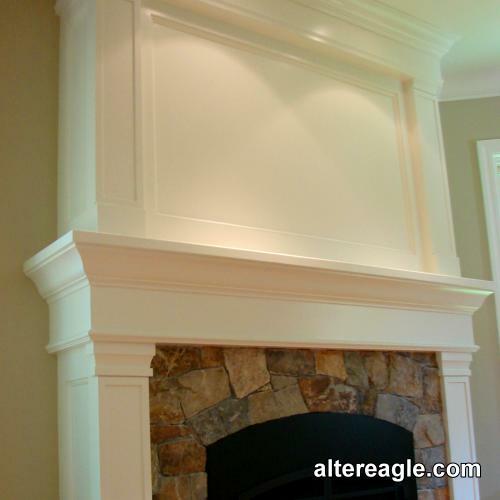 Estimating & Installation: A paint grade custom surround with an overmantel can be estimated during a site visit. 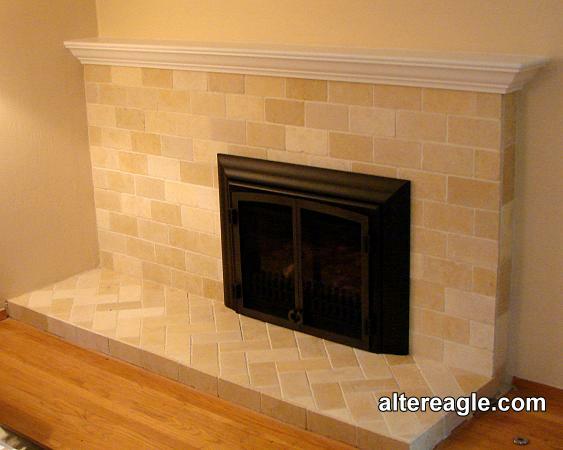 They are typically measured after a tile or face update and installed over the existing brick or new tile. 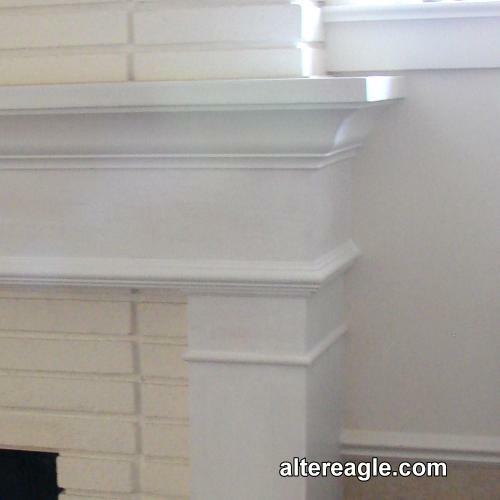 The side clearance is 6 to 8 inches at the columns and the top 10 to 12 inches to where the mantel starts. 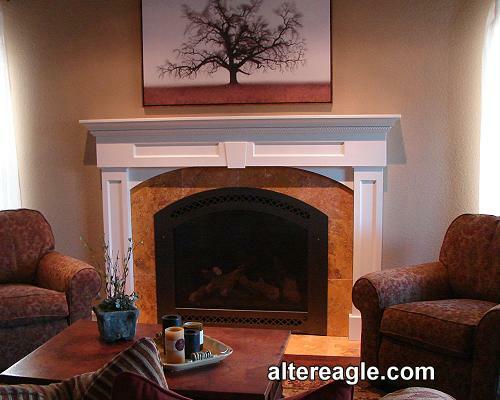 Our nature to gather around the warmth of a fire goes long into our history. 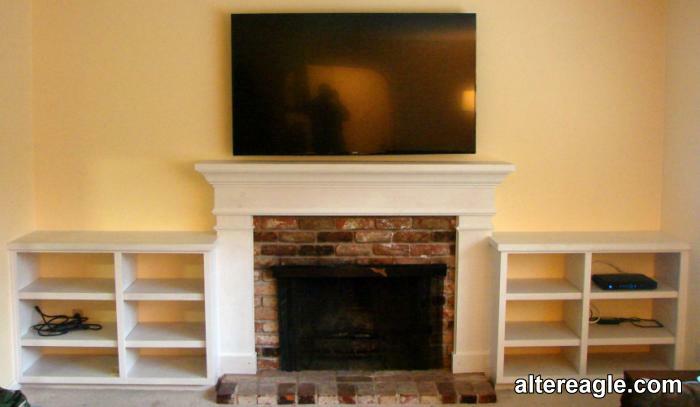 We've had all iterations of ways to encapsulate that need for cooking light and heat in our homes, but the modern idea of a mantel for a fireplace only goes back to the 12th century. 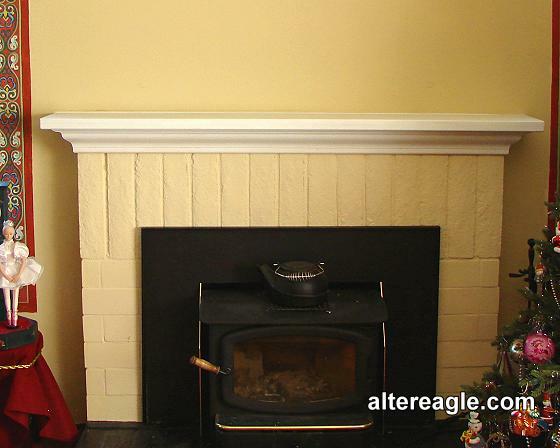 On the left is what is thought to be the earliest known mantel from the early Norman times. 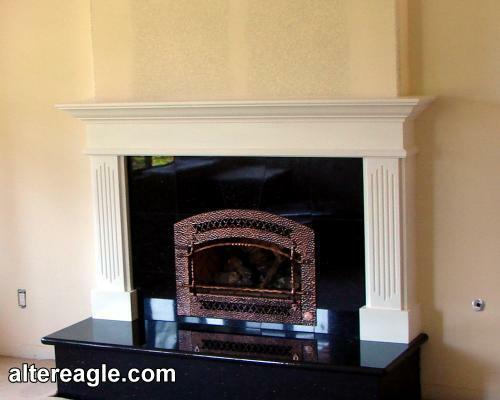 Unlike the single story Saxon homes the Norman 2 story home in Britain wouldn't accommodate the drifting smoke dissipating through the rafters so the need for the stone mantel with deep overhangs to capture the soot and the clay pipe chimney evolved. 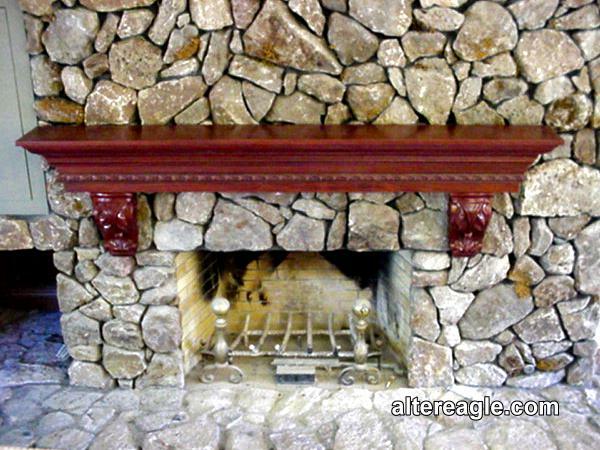 Here in America into the 1800's a fireplace was purely practical and the mantel was just the beam or lintel over the opening. 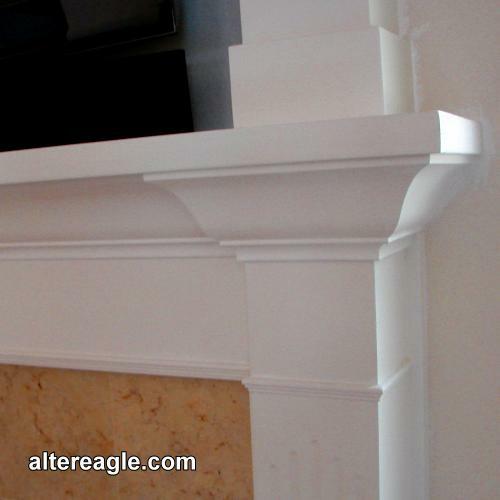 Although in the Georgian era in the early 1700's East Coast architects imported fine marble mantels of ornate Italian design. With the American Revolution and the blockades that all comes to an end and we began carving our own copies of the classical orders. Ben Franklin and Count Rumsford revolutionize the technology and with the advent of the industrial revolution more iron with coal and stoves are put into use. 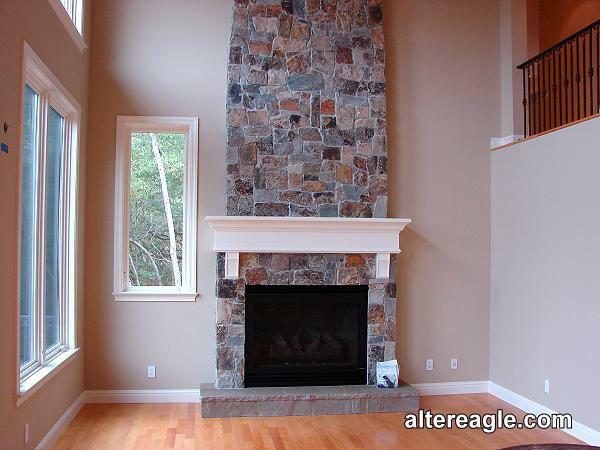 Getting more efficient the fireplace becomes smaller and mantels more of a focal point. 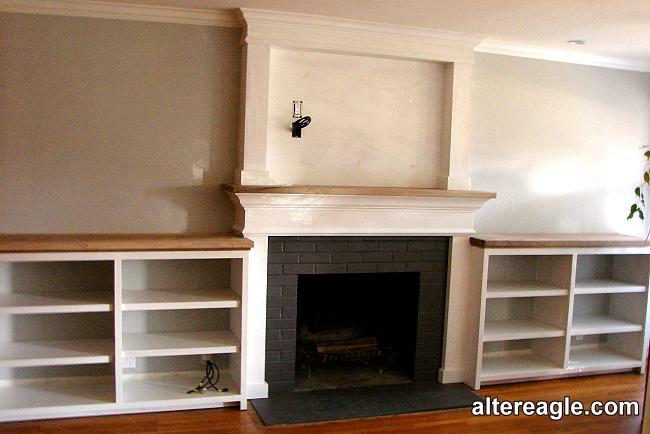 Fireplace surrounds and overmantels with custom cabinets. 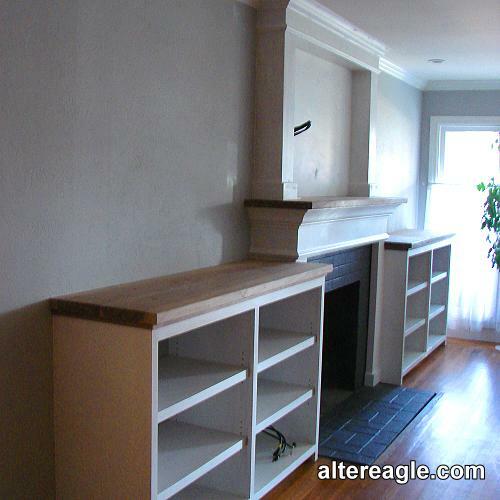 Lower side cabinets and overmantels with upper cabinets. 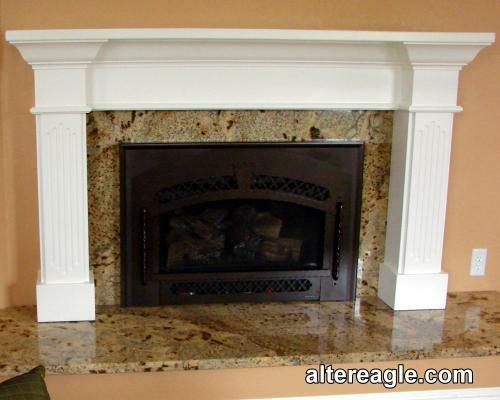 We also build fireplace mantels for those special design situations with additional trim elements or to interior designer specifications. 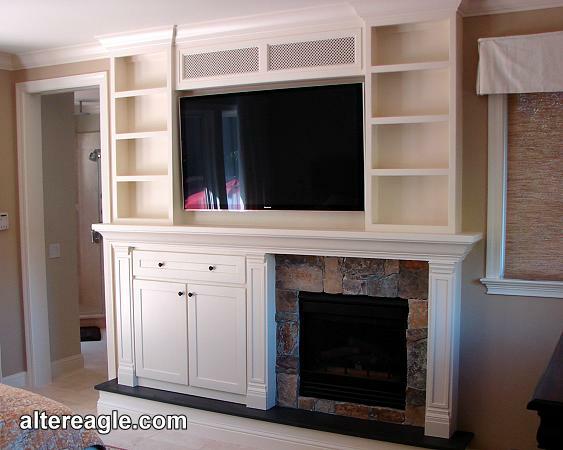 Estimating & Installation: Paint grade custom fireplace mantels with cabinets are measured during a site visit and estimated within a day or two with an onsite "ballpark" cost. 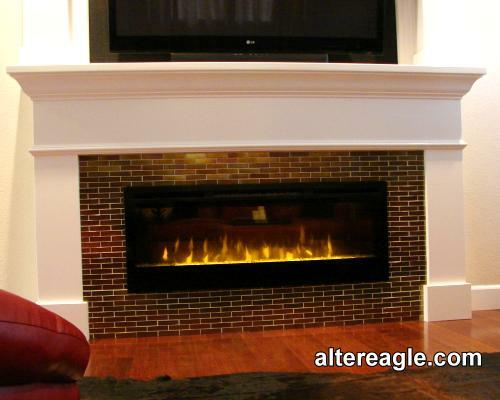 They are typically measured after a tile or face update and installed over the existing brick or new tile. 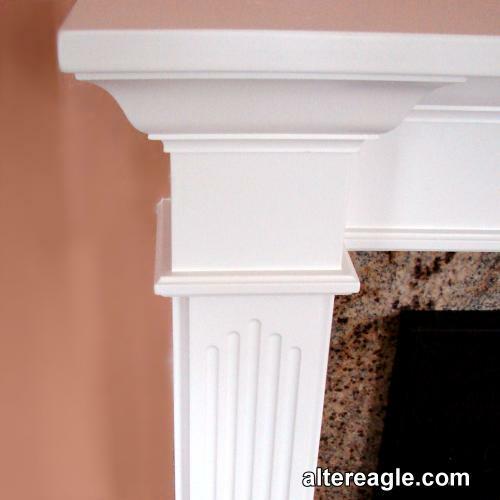 The side clearance is 6 to 8 inches at the columns and the top 10 to 12 inches to where the mantel starts. 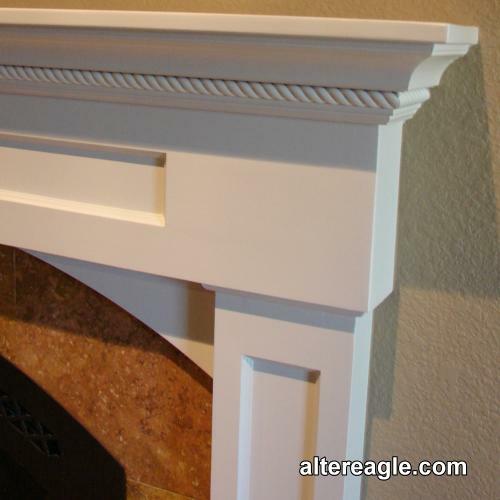 Custom fireplace mantel shelves are the top section (entablature) of a fireplace surround without the columns. 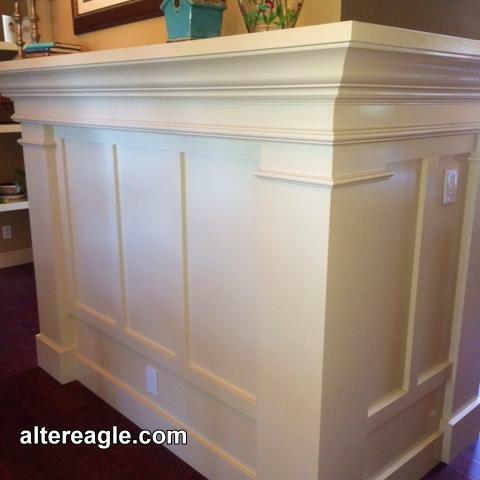 They typically have a top cap and a crown molding to give them depth. 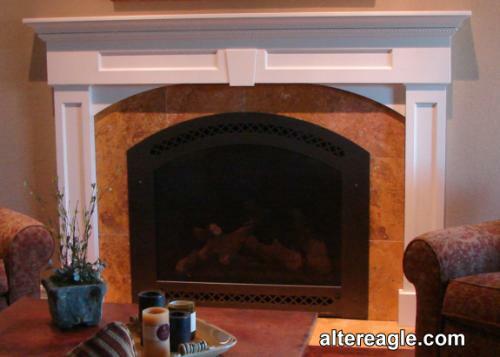 They can also be built up with architectural elements or have corbels (brackets) which are usually supplied by the customer. 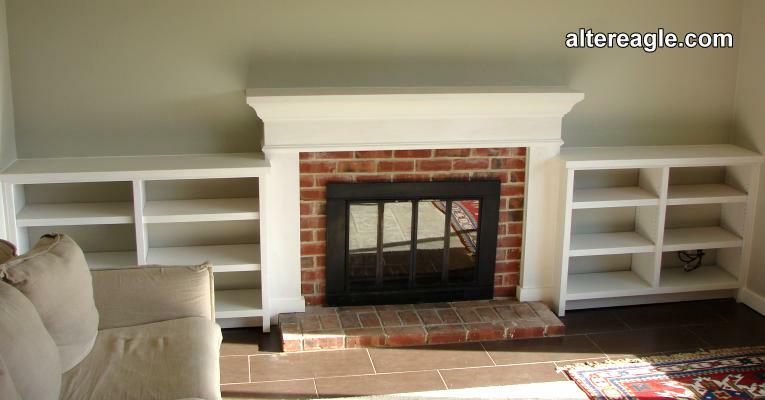 Estimating & Installation: Paint grade custom fireplace mantels shelves are measured during a site visit and estimated onsite. 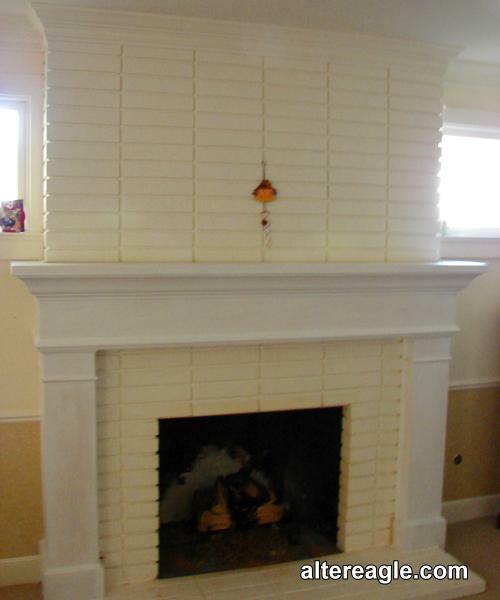 They are typically measured after a tile or face update and installed over the existing brick or new tile. 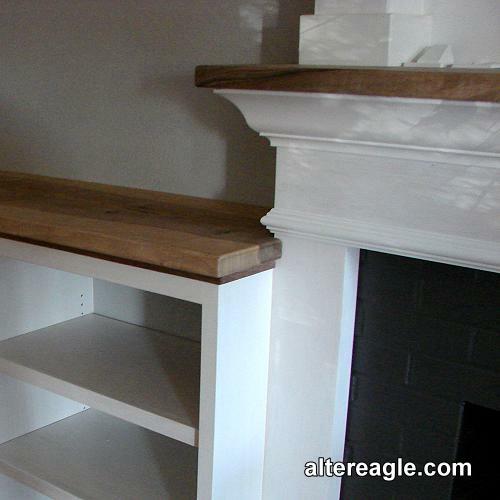 The clearance to the top 10 to 12 inches to where the mantel starts.